On a mid-April morning, I ventured up to Powell Butte to see what I might stumble across. This is a popular location in Portland, in part because it is so highly accessible to many residents of the surrounding communities but also because it’s a mountain biking, horseback riding, and dog-friendly location. This can lead to some pretty high traffic which is not necessarily something you want when you’re out birding. Even still, the sweeping views of the entire area from the summit are worth a short walk from the main parking lot and you may almost always find something of interest. On this particular trip, the savannah sparrows in particular seemed abundant. It seemed you could find one every few yards once you started along the trail. These little birds are identified by clear brown streaking on a white or creamy breast, a relatively clear stomach, a white or cream stripe down the center of the forehead, and two eyebrows which are varying amounts of yellow, starting from behind the beak and carrying over and just behind the dark eye. 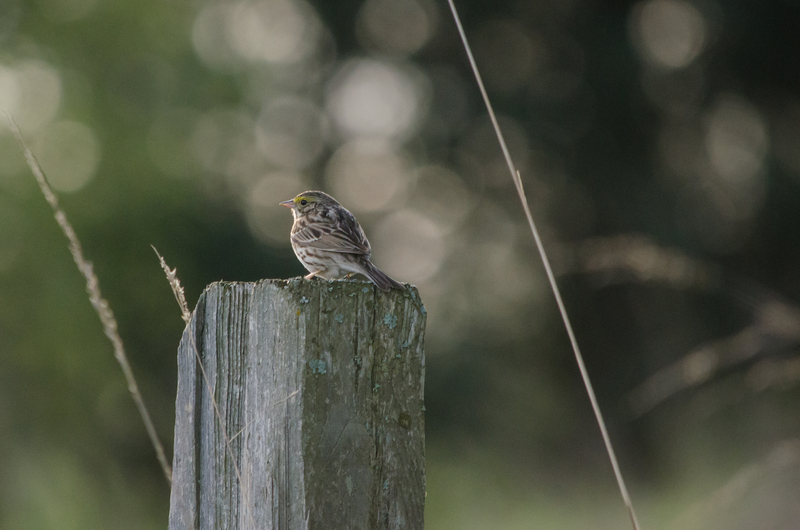 There were a few song sparrows about as well, as there almost always are in the Portland area. This particular fellow didn’t seem to mind me watching him preen at all, and he stayed all puffed up for a few minutes quite comically. Common yellowthroats nest atop the butte, and several were moving among the grasses. 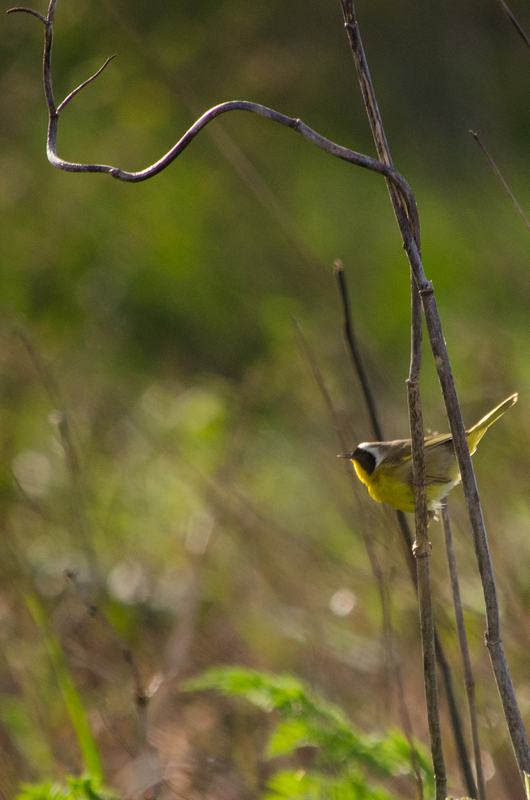 These warblers are often heard more than they are seen, staying low and only popping out for a moment to look around before diving back down under cover. The males have a distinct black mask across their eyes, with a white streak across the top of the mask. The throat is a bright yellow, the color descending down onto the belly, while the back, wings, and sides are a draub khaki or olive color. The females are less bright and lack the obvious mask. A few other obvious signs of spring were found on Powell Butte as well during this outing: a fawn was spotted crossing an open field, and fuzzy caterpillars were crawling through the grasses. Other birds encountered included American kestrel, killdeer, lesser goldfinch, American crow, and Western scrub jay. 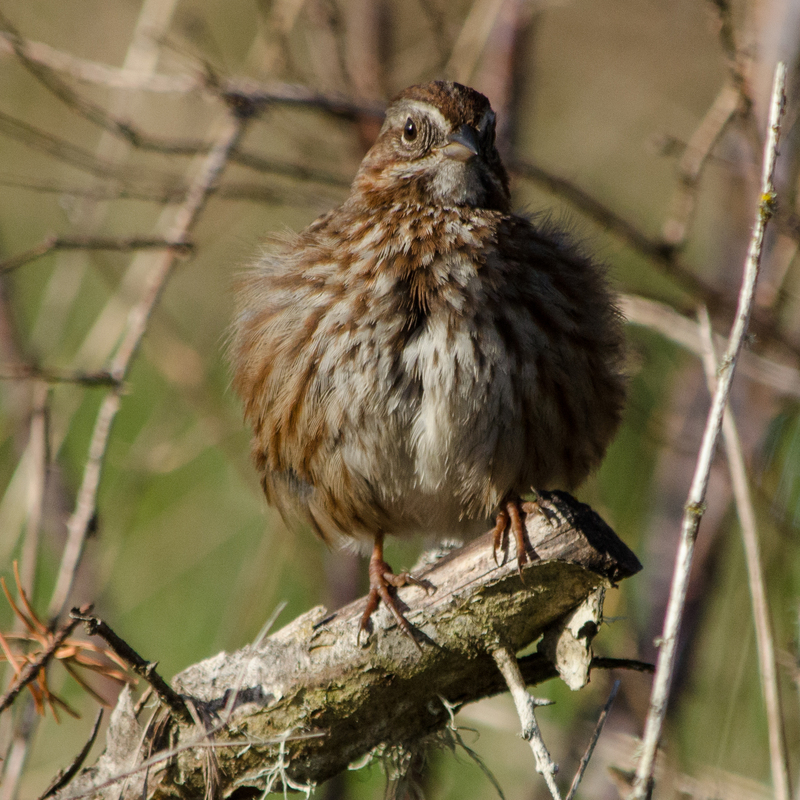 To find a little more information about Powell Butte and other places for bird watching, including addresses and websites, check out my Birding Locations page. Be sure to visit my Flickr site for more images from my trip to Powell Butte this day, as well as some of my other photographs.